Using SVG's animation elements. SVG document fragments can describe time-based modifications to the document's elements. Using the various animation elements, you can define motion paths, fade-in or fade-out effects, and objects that grow, shrink, spin or change color. SVG has been designed to allow future versions of SMIL [SMIL1] to use animated or static SVG content as media components. In the future, it is expected that future versions of SMIL will be modularized and that components of it could be used in conjunction with SVG and other XML grammars to achieve animation effects. SVG's animation elements were developed in collaboration with the W3C Synchronized Multimedia (SYMM) Working Group, developers of the Synchronized Multimedia Integration Language (SMIL) 1.0 Specification [SMIL1]. The SYMM working group, in collaboration with the SVG working group, has authored the SMIL Animation specification [SMILANIM], which represents a general-purpose XML animation feature set. SVG incorporates the animation features defined in the SMIL Animation specification and provides some SVG-specific extensions. For an introduction to the approach and features available in any language that supports SMIL Animation, see SMIL Animation overview and SMIL Animation animation model. For the list of animation features which go beyond SMIL Animation, see SVG extensions to SMIL Animation. SVG is a host language in terms of SMIL Animation and therefore introduces additional constraints and features as permitted by that specification. Except for any SVG-specific rules explicitly mentioned in this specification, the normative definition for SVG's animation elements and attributes is the SMIL Animation [SMILANIM] specification. For compatibility with other aspects of the language, SVG uses URI references via an xlink:href attribute to identify the elements which are to be targets of the animations. SMIL Animation requires that the host language define the meaning for document begin and the document end. Since an 'svg' is sometimes the root of the XML document tree and other times can be a component of a parent XML grammar, the document begin for a given SVG document fragment is defined to be the exact time at which the 'svg' element's onload event is triggered. The document end of an SVG document fragment is the point at which the document fragment has been released and is no longer being processed by the user agent. For SVG, the term presentation time indicates the position in the timeline relative to the document begin of a given document fragment. SVG defines more constrained error processing than is defined in the SMIL Animation [SMILANIM] specification. SMIL Animation defines error processing behavior where the document continues to run in certain error situations, whereas all animations within an SVG document fragment will stop in the event of any error within the document (see Error processing). Example anim01 below demonstrates each of SVG's five animation elements. <rect x="1" y="1" width="798" height="298"
<rect id="RectElement" x="300" y="100" width="300" height="100"
<animateMotion path="M 0 0 L 100 100"
The sections below describe the various animation attributes and elements. The following attributes are common to all animation elements and identify the target element for the animation. A URI reference to the element which is the target of this animation and which therefore will be modified over time. The target element must be part of the current SVG document fragment. <uri> must point to exactly one target element which is capable of being the target of the given animation. If <uri> points to multiple target elements, if the given target element is not capable of being a target of the given animation, or if the given target element is not part of the current SVG document fragment, then the document is in error (see Error processing). If the xlink:href attribute is not provided, then the target element will be the immediate parent element of the current animation element. Refer to the descriptions of the individual animation elements for any restrictions on what types of elements can be targets of particular types of animations. Except for any SVG-specific rules explicitly mentioned in this specification, the normative definition for this attribute is the SMIL Animation [SMILANIM] specification. In particular, see SMIL Animation: Specifying the animation target. The following attributes identify the target attribute or property for the given target element whose value changes over time. Specifies the name of the target attribute. An XMLNS prefix may be used to indicate the XML namespace for the attribute. The prefix will be interpreted in the scope of the current (i.e., the referencing) animation element. attributeType = "CSS | XML | auto"
This specifies that the value of "attributeName" is the name of a CSS property defined as animatable in this specification. This specifies that the value of "attributeName" is the name of an XML attribute defined in the default XML namespace for the target element. If the value for attributeName has an XMLNS prefix, the implementation must use the associated namespace as defined in the scope of the target element. The attribute must be defined as animatable in this specification. The implementation should match the attributeName to an attribute for the target element. The implementation must first search through the list of CSS properties for a matching property name, and if none is found, search the default XML namespace for the element. The following attributes are common to all animation elements and control the timing of the animation, including what causes the animation to start and end, whether the animation runs repeatedly, and whether to retain the end state the animation once the animation ends. Defines when the element should begin (i.e. become active). The attribute value is a semicolon separated list of values. begin-value-list ::= begin-value (S? ";" S? begin-value-list )? A semicolon separated list of begin values. The interpretation of a list of begin times is detailed in SMIL Animation's section on "Evaluation of begin and end time lists". For SMIL Animation, this describes the element begin as an offset from an implicit syncbase. For SVG, the implicit syncbase begin is defined to be relative to the document begin. SInce the document end in SVG is always undetermined, a negative offset value in SVG is always an error. syncbase-value ::= ( Id-value "." ( "begin" | "end" ) ) ( S? ("+"|"-") S? Clock-value )? Describes a syncbase and an optional offset from that syncbase. The element begin is defined relative to the begin or active end of another animation. A syncbase consists of an ID reference to another animation element followed by either begin or end to identify whether to synchronize with the beginning or active end of the referenced animation element. event-value ::= ( Id-value "." )? ( event-ref ) ( S? ("+"|"-") S? Clock-value )? Describes an event and an optional offset that determine the element begin. The animation begin is defined relative to the time that the event is raised. The list of event-symbols available for a given event-base element is the list of event attributes available for the given element as defined by the SVG DTD, with the one difference that the leading 'on' is removed from the event name (i.e., the animation event name is 'click', not 'onclick'). A list of all events supported by SVG can be found in Complete list of supported events. Details of event-based timing are described in SMIL Animation: Unifying Event-based and Scheduled Timing. repeat-value ::= ( Id-value "." )? "repeat(" integer ")" ( S? ("+"|"-") S? Clock-value )? Describes a qualified repeat event. The element begin is defined relative to the time that the repeat event is raised with the specified iteration value. accessKey-value ::= "accessKey(" character ")" ( S? ("+"|"-") S? Clock-value )? Describes an accessKey that determines the element begin. The element begin is defined relative to the time that the accessKey character is input by the user. "wallclock-sync-value : wallclock(" wallclock-value ")"
Describes the element begin as a real-world clock time. The wallclock time syntax is based upon syntax defined in [ISO8601]. The begin of the animation will be determined by a "beginElement()" method call or a hyperlink targeted to the element. The animation DOM methods are described in DOM interfaces. Hyperlink-based timing is described in SMIL Animation: Hyperlinks and timing. Except for any SVG-specific rules explicitly mentioned in this specification, the normative definition for this attribute is the SMIL Animation [SMILANIM] specification. In particular, see SMIL Animation: 'begin' attribute. dur : Clock-value | "media" | "indefinite"
Specifies the length of the simple duration in presentation time. Value must be greater than 0. Specifies the simple duration as the intrinsic media duration. This is only valid for elements that define media. Specifies the simple duration as indefinite. If the animation does not have a dur attribute, the simple duration is indefinite. Note that interpolation will not work if the simple duration is indefinite (although this may still be useful for 'set' elements). Except for any SVG-specific rules explicitly mentioned in this specification, the normative definition for this attribute is the SMIL Animation [SMILANIM] specification. In particular, see SMIL Animation: 'dur' attribute. Defines an end value for the animation that can constrain the active duration. The attribute value is a semicolon separated list of values. end-value-list ::= end-value (S? ";" S? end-value-list )? A semicolon separated list of end values. The interpretation of a list of end times is detailed below. Describes the active end of the animation. A value of "indefinite" specifies that the end of the animation will be determined by a "endElement()" method call (the animation DOM methods are described in DOM interfaces). Except for any SVG-specific rules explicitly mentioned in this specification, the normative definition for this attribute is the SMIL Animation [SMILANIM] specification. In particular, see description of SMIL Animation: 'end' attribute. min : Clock-value | "media"
Specifies the minimum value of the active duration. Specifies the length of the minimum value of the active duration, measured in local time. The default value for min is "0". This does not constrain the active duration at all. Except for any SVG-specific rules explicitly mentioned in this specification, the normative definition for this attribute is the SMIL Animation [SMILANIM] specification. max : Clock-value | "media"
Specifies the maximum value of the active duration. Specifies the length of the maximum value of the active duration, measured in local time. There is no default value for max. This does not constrain the active duration at all. restart : "always" | "whenNotActive" | "never"
The animation can be restarted at any time. The animation can only be restarted when it is not active (i.e. after the active end). Attempts to restart the animation during its active duration are ignored. Except for any SVG-specific rules explicitly mentioned in this specification, the normative definition for this attribute is the SMIL Animation [SMILANIM] specification. In particular, see SMIL Animation: 'restart' attribute. repeatCount : numeric value | "indefinite"
This is a (base 10) "floating point" numeric value that specifies the number of iterations. It can include partial iterations expressed as fraction values. A fractional value describes a portion of the simple duration. Values must be greater than 0. The animation is defined to repeat indefinitely (i.e. until the document ends). Except for any SVG-specific rules explicitly mentioned in this specification, the normative definition for this attribute is the SMIL Animation [SMILANIM] specification. In particular, see SMIL Animation: 'repeatCount' attribute. repeatDur : Clock-value | "indefinite"
Specifies the duration in presentation time to repeat the animation function f(t). Except for any SVG-specific rules explicitly mentioned in this specification, the normative definition for this attribute is the SMIL Animation [SMILANIM] specification. In particular, see SMIL Animation: 'repeatDur' attribute. fill : "freeze" | "remove"
The animation effect F(t) is defined to freeze the effect value at the last value of the active duration. The animation effect is "frozen" for the remainder of the document duration (or until the animation is restarted - see SMIL Animation: Restarting animation ). The animation effect is removed (no longer applied) when the active duration of the animation is over. After the active end of the animation, the animation no longer affects the target (unless the animation is restarted - see SMIL Animation: Restarting animation ). Except for any SVG-specific rules explicitly mentioned in this specification, the normative definition for this attribute is the SMIL Animation [SMILANIM] specification. In particular, see SMIL Animation: 'fill' attribute. The SMIL Animation [SMILANIM] specification defines the detailed processing rules associated with the above attributes. Except for any SVG-specific rules explicitly mentioned in this specification, the SMIL Animation [SMILANIM] specification is the normative definition of the processing rules for the above attributes. Full-clock-val    ::= Hours ":" Minutes ":" Seconds ("." Fraction)? Partial-clock-val ::= Minutes ":" Seconds ("." Fraction)? Timecount-val     ::= Timecount ("." Fraction)? (Metric)? Metric            ::= "h" | "min" | "s" | "ms"
For Timecount values, the default metric suffix is "s" (for seconds). No embedded white space is allowed in clock values, although leading and trailing white space characters will be ignored. Clock values describe presentation time. The following attributes are common to elements 'animate', 'animateMotion', 'animateColor' and 'animateTransform'. These attributes define the values that are assigned to the target attribute or property over time. The attributes below provide control over the relative timing of keyframes and the interpolation method between discrete values. calcMode = "discrete | linear | paced | spline"
Specifies the interpolation mode for the animation. This can take any of the following values. 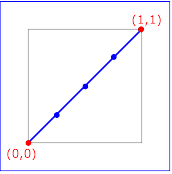 The default mode is "linear", however if the attribute does not support linear interpolation (e.g. for strings), the calcMode attribute is ignored and discrete interpolation is used. This specifies that the animation function will jump from one value to the next without any interpolation. 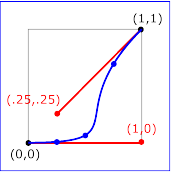 Simple linear interpolation between values is used to calculate the animation function. Except for 'animateMotion', this is the default calcMode. Defines interpolation to produce an even pace of change across the animation. This is only supported for values that define a linear numeric range, and for which some notion of "distance" between points can be calculated (e.g. position, width, height, etc.). If "paced" is specified, any keyTimes or keySplines will be ignored. For 'animateMotion', this is the default calcMode. 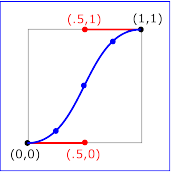 Interpolates from one value in the values list to the next according to a time function defined by a cubic Bezier spline. The points of the spline are defined in the keyTimes attribute, and the control points for each interval are defined in the keySplines attribute. Except for any SVG-specific rules explicitly mentioned in this specification, the normative definition for this attribute is the SMIL Animation [SMILANIM] specification. In particular, see SMIL Animation: 'calcMode' attribute. A semicolon-separated list of one or more values. Vector-valued attributes are supported using the vector syntax of the attributeType domain. Except for any SVG-specific rules explicitly mentioned in this specification, the normative definition for this attribute is the SMIL Animation [SMILANIM] specification. In particular, see SMIL Animation: 'values' attribute. A semicolon-separated list of time values used to control the pacing of the animation. Each time in the list corresponds to a value in the values attribute list, and defines when the value is used in the animation function. Each time value in the keyTimes list is specified as a floating point value between 0 and 1 (inclusive), representing a proportional offset into the simple duration of the animation element. If a list of keyTimes is specified, there must be exactly as many values in the keyTimes list as in the values list. Each successive time value must be greater than or equal to the preceding time value. For linear and spline animation, the first time value in the list must be 0, and the last time value in the list must be 1. The keyTime associated with each value defines when the value is set; values are interpolated between the keyTimes. For discrete animation, the first time value in the list must be 0. The time associated with each value defines when the value is set; the animation function uses that value until the next time defined in keyTimes. If the interpolation mode is "paced", the keyTimes attribute is ignored. If there are any errors in the keyTimes specification (bad values, too many or too few values), the document fragment is in error (see error processing). If the simple duration is indefinite, any keyTimes specification will be ignored. Except for any SVG-specific rules explicitly mentioned in this specification, the normative definition for this attribute is the SMIL Animation [SMILANIM] specification. In particular, see SMIL Animation: 'keyTimes' attribute. A set of Bezier control points associated with the keyTimes list, defining a cubic Bezier function that controls interval pacing. The attribute value is a semicolon separated list of control point descriptions. Each control point description is a set of four values: x1 y1 x2 y2, describing the Bezier control points for one time segment. The keyTimes values that define the associated segment are the Bezier "anchor points", and the keySplines values are the control points. Thus, there must be one fewer sets of control points than there are keyTimes. The values must all be in the range 0 to 1. This attribute is ignored unless the calcMode is set to "spline". If there are any errors in the keySplines specification (bad values, too many or too few values), the document fragment is in error (see error processing). Except for any SVG-specific rules explicitly mentioned in this specification, the normative definition for this attribute is the SMIL Animation [SMILANIM] specification. In particular, see SMIL Animation: 'keySplines' attribute. Specifies the starting value of the animation. Except for any SVG-specific rules explicitly mentioned in this specification, the normative definition for this attribute is the SMIL Animation [SMILANIM] specification. In particular, see SMIL Animation: 'from' attribute. Specifies the ending value of the animation. Except for any SVG-specific rules explicitly mentioned in this specification, the normative definition for this attribute is the SMIL Animation [SMILANIM] specification. In particular, see SMIL Animation: 'to' attribute. Specifies a relative offset value for the animation. Except for any SVG-specific rules explicitly mentioned in this specification, the normative definition for this attribute is the SMIL Animation [SMILANIM] specification. In particular, see SMIL Animation: 'by' attribute. The animation values specified in the animation element must be legal values for the specified attribute. Leading and trailing white space, and white space before and after semicolon separators, will be ignored. All values specified must be legal values for the specified attribute (as defined in the associated namespace). If any values are not legal, the document fragment is in error (see error processing). If a list of values is used, the animation will apply the values in order over the course of the animation. If a list of values is specified, any from, to and by attribute values are ignored. The processing rules for the variants of from/by/to animations are described in Animation function values. The following figure illustrates the interpretation of the keySplines attribute. Each diagram illustrates the effect of keySplines settings for a single interval (i.e. between the associated pairs of values in the keyTimes and values lists.). 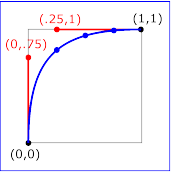 The horizontal axis can be thought of as the input value for the unit progress of interpolation within the interval - i.e. the pace with which interpolation proceeds along the given interval. The vertical axis is the resulting value for the unit progress, yielded by the keySplines function. Another way of describing this is that the horizontal axis is the input unit time for the interval, and the vertical axis is the output unit time. See also the section Timing and real-world clock times. keySplines="0 0 1 1" (the default) keySplines=".5 0 .5 1"
keySplines="0 .75 .25 1" keySplines="1 0 .25 .25"
<animate dur="4s" values="10; 20" keyTimes="0; 1"
For a formal definition of Bezier spline calculation, see [FOLEY-VANDAM]. <animate attributeName="width" from="0px" to="10px" dur="10s"
At the end of the first repetition, the rectangle has a width of 30 pixels. At the end of the second repetition, the rectangle has a width of 40 pixels. At the end of the fifth repetition, the rectangle has a width of 70 pixels. For more information about additive animations, see SMIL Animation: Additive animation. For more information on cumulative animations, see SMIL Animation: Controlling behavior of repeating animation - Cumulative animation. The following attributes are common to elements 'animate', 'animateMotion', 'animateColor' and 'animateTransform'. additive = "replace | sum"
Controls whether or not the animation is additive. Specifies that the animation will add to the underlying value of the attribute and other lower priority animations. Specifies that the animation will override the underlying value of the attribute and other lower priority animations. This is the default, however the behavior is also affected by the animation value attributes by and to, as described in SMIL Animation: How from, to and by attributes affect additive behavior. Except for any SVG-specific rules explicitly mentioned in this specification, the normative definition for this attribute is the SMIL Animation [SMILANIM] specification. In particular, see SMIL Animation: 'additive' attribute. accumulate = "none | sum"
Controls whether or not the animation is cumulative. Specifies that each repeat iteration after the first builds upon the last value of the previous iteration. Specifies that repeat iterations are not cumulative. This is the default. This attribute is ignored if the target attribute value does not support addition, or if the animation element does not repeat. Cumulative animation is not defined for "to animation". This attribute will be ignored if the animation function is specified with only the to attribute. Except for any SVG-specific rules explicitly mentioned in this specification, the normative definition for this attribute is the SMIL Animation [SMILANIM] specification. In particular, see SMIL Animation: 'accumulate' attribute. SVG allows both attributes and properties to be animated. If a given attribute or property is inheritable by descendants, then animations on a parent element such as a 'g' element has the effect of propagating the attribute or property animation values to descendant elements as the animation proceeds; thus, descendant elements can inherit animated attributes and properties from their ancestors. Except for any SVG-specific rules explicitly mentioned in this specification, the normative definition for this element is the SMIL Animation [SMILANIM] specification. In particular, see SMIL Animation: 'animate' element. %stdAttrs;, %testAttrs;, externalResourcesRequired, %animationEvents;, %animElementAttrs;, %animAttributeAttrs;, %animTimingAttrs;, %animValueAttrs;, %animAdditionAttrs;. For a list of attributes and properties that can be animated using the 'animate' element, see Elements, attributes and properties that can be animated. The 'set' element provides a simple means of just setting the value of an attribute for a specified duration. It supports all attribute types, including those that cannot reasonably be interpolated, such as string and boolean values. The 'set' element is non-additive. The additive and accumulate attributes are not allowed, and will be ignored if specified. Except for any SVG-specific rules explicitly mentioned in this specification, the normative definition for this element is the SMIL Animation [SMILANIM] specification. In particular, see SMIL Animation: 'set' element. Specifies the value for the attribute during the duration of the 'set' element. The argument value must match the attribute type. %stdAttrs;, %testAttrs;, externalResourcesRequired, %animationEvents;, %animElementAttrs;, %animAttributeAttrs;, %animTimingAttrs;. For a list of attributes and properties that can be animated using the 'set' element, see Elements, attributes and properties that can be animated. The 'animateMotion' element causes a referenced element to move along a motion path. Except for any SVG-specific rules explicitly mentioned in this specification, the normative definition for this element is the SMIL Animation [SMILANIM] specification. In particular, see SMIL Animation: 'animateMotion' element. Specifies the interpolation mode for the animation. Refer to general description of the calcMode attribute above. The only difference is that the default value for the calcMode for 'animateMotion' is paced. See SMIL Animation: 'calcMode' attribute for 'animateMotion'. The motion path, expressed in the same format and interpreted the same way as the d= attribute on the 'path' element. The effect of a motion path animation is to add a supplemental transformation matrix onto the CTM for the referenced object which causes a translation along the x- and y-axis of the current user coordinate system by the computed X and Y values computed over time. keyPoints takes a semicolon-separated list of floating point values between 0 and 1 and indicates how far along the motion path the object shall move at the moment in time specified by corresponding keyTimes value. Distance calculations use the user agent's distance along the path algorithm. Each progress value in the list corresponds to a value in the keyTimes attribute list. If a list of keyPoints is specified, there must be exactly as many values in the keyPoints list as in the keyTimes list. If there are any errors in the keyPoints specification (bad values, too many or too few values), then the document is in error (see Error processing). rotate = "<angle> | auto | auto-reverse"
auto indicates that the object is rotated over time by the angle of the direction (i.e., directional tangent vector) of the motion path. auto-reverse indicates that the object is rotated over time by the angle of the direction (i.e., directional tangent vector) of the motion path plus 180 degrees. An actual angle value can also be given, which represents an angle relative to the x-axis of current user coordinate system. The rotate attribute adds a supplemental transformation matrix onto the CTM to apply a rotation transformation about the origin of the current user coordinate system. The rotation transformation is applied after the supplemental translation transformation that is computed due to the path attribute. The default value is 0. The origin attribute is defined in the SMIL Animation specification [SMILANIM-ATTR-ORIGIN]. It has no effect in SVG. %stdAttrs;, %testAttrs;, externalResourcesRequired, %animationEvents;, %animElementAttrs;, %animTimingAttrs;, values, keyTimes, keySplines, from, to, by, %animAdditionAttrs;. A URI reference to the 'path' element which defines the motion path. For 'animateMotion', the specified values for from, by, to and values consists of x, y coordinate pairs, with a single comma and/or white space separating the x coordinate from the y coordinate. For example, from="33,15" specifies an x coordinate value of 33 and a y coordinate value of 15. If provided, the values attribute must consists of a list of x, y coordinate pairs. Coordinate values are separated by at least one white space character or a comma. Additional white space around the separator is allowed. For example, values="10,20;30,20;30,40" or values="10mm,20mm;30mm,20mm;30mm,40mm". Each coordinate represents a length. Attributes from, by, to and values specify a shape on the current canvas which represents the motion path. the path attribute defines a motion path directly on 'animateMotion' element using any of SVG's path data commands. the 'mpath' sub-element provides the ability to reference an external 'path' element as the definition of the motion path. Note that SVG's path data commands can only contain values in user space, whereas from, by, to and values can specify coordinates in user space or using unit identifiers. See Units. The various (x,y) points of the shape provide a supplemental transformation matrix onto the CTM for the referenced object which causes a translation along the x- and y-axis of the current user coordinate system by the (x,y) values of the shape computed over time. Thus, the referenced object is translated over time by the offset of the motion path relative to the origin of the current user coordinate system. The supplemental transformation is applied on top of any transformations due to the target element's transform attribute or any animations on that attribute due to 'animateTransform' elements on the target element. The additive and accumulate attributes apply to 'animateMotion' elements. Multiple 'animateMotion' elements all simultaneously referencing the same target element can be additive with respect to each other; however, the transformations which result from the 'animateMotion' elements are always supplemental to any transformations due to the target element's transform attribute or any 'animateTransform' elements. The default calculation mode (calcMode) for animateMotion is "paced". This will produce constant velocity motion along the specified path. Note that while animateMotion elements can be additive, it is important to observe that the addition of two or more "paced" (constant velocity) animations might not result in a combined motion animation with constant velocity. When a path is combined with "discrete", "linear" or "spline" calcMode settings, and if attribute keyPoints is not provided, the number of values is defined to be the number of points defined by the path, unless there are "move to" commands within the path. A "move to" command within the path (i.e. other than at the beginning of the path description) A "move to" command does not count as an additional point when dividing up the duration, or when associating keyTimes, keySplines and keyPoints values. When a path is combined with a "paced" calcMode setting, all "move to" commands are considered to have 0 length (i.e. they always happen instantaneously), and is not considered in computing the pacing. For more flexibility in controlling the velocity along the motion path, the keyPoints attribute provides the ability to specify the progress along the motion path for each of the keyTimes specified values. If specified, keyPoints causes keyTimes to apply to the values in keyPoints rather than the points specified in the values attribute array or the points on the path attribute. The override rules for 'animateMotion are as follows. Regarding the definition of the motion path, the 'mpath' element overrides the the path attribute, which overrides values, which overrides from/by/to. Regarding determining the points which correspond to the keyTimes attributes, the keyPoints attribute overrides path, which overrides values, which overrides from/by/to. At any time t within a motion path animation of duration dur, the computed coordinate (x,y) along the motion path is determined by finding the point (x,y) which is t/dur distance along the motion path using the user agent's distance along the path algorithm. The following example demonstrates the supplemental transformation matrices that are computed during a motion path animation. Example animMotion01 shows a triangle moving along a motion path. <path d="M100,250 C 100,50 400,50 400,250"
The following table shows the supplemental transformation matrices that are applied to achieve the effect of the motion path animation. For a list of elements that can be animated using the 'animateMotion' element, see Elements, attributes and properties that can be animated. The 'animateColor' element specifies a color transformation over time. Except for any SVG-specific rules explicitly mentioned in this specification, the normative definition for this element is the SMIL Animation [SMILANIM] specification. In particular, see SMIL Animation: 'animateColor' element. The values attribute for the 'animateColor' element consists of a semicolon-separated list of color values, with each color value expressed in the above syntax. Out of range color values can be provided, but user agent processing will be implementation dependent. User agents should clamp color values to allow color range values as late as possible, but note that system differences might preclude consistent behavior across different systems. The 'color-interpolation' property applies to color interpolations that result from 'animateColor' animations. For a list of attributes and properties that can be animated using the 'animateColor' element, see Elements, attributes and properties that can be animated. The 'animateTransform' element animates a transformation attribute on a target element, thereby allowing animations to control translation, scaling, rotation and/or skewing. type = "translate | scale | rotate | skewX | skewY"
Indicates the type of transformation which is to have its values change over time. For a type="translate", each individual value is expressed as <tx> [,<ty>]. For a type="scale", each individual value is expressed as <sx> [,<sy>]. For a type="rotate", each individual value is expressed as <rotate-angle> [<cx> <cy>]. For a type="skewX" and type="skewY", each individual value is expressed as <skew-angle>. The values attribute for the 'animateTransform' element consists of a semicolon-separated list of values, where each individual value is expressed as described above for from, by and to. If calcMode has the value paced, then a total "distance" for each component of the transformation is calculated (e.g., for a translate operation, a total distance is calculated for both tx and ty) consisting of the sum of the absolute values of the differences between each pair of values, and the animation runs to produce a constant distance movement for each individual component. For a list of attributes and properties that can be animated using the 'animateTransform' element, see Elements, attributes and properties that can be animated. SVG has a defined set of basic data types for its various supported attributes and properties. For those attributes and properties that can be animated, the following table indicates which animation elements can be used to animate each of the basic data types. If a given attribute or property can take values of keywords (which are not additive) or numeric values (which are additive), then additive animations are possible if the subsequent animation uses a numeric value even if the base animation uses a keyword value; however, if the subsequent animation uses a keyword value, additive animation is not possible. <color> yes yes yes yes no Only RGB color values are additive. <paint> yes yes yes yes no Only RGB color values are additive. <transform-list> yes no no no yes Additive means that a transformation is post-multiplied to the base set of transformations. Any deviation from the above table or other special note about the animation capabilities of a particular attribute or property is included in the section of the specification where the given attribute or property is defined. Example dom01 shows a simple animation using the DOM. <svg width="4cm" height="2cm" viewBox="0 0 400 200"
// Call ShowAndGrowElement again <timer_increment> milliseconds later. <rect x="1" y="1" width="398" height="198"
The onload="StartAnimation(evt)" attribute indicates that, once the document has been fully loaded and processed, invoke ECMAScript function StartAnimation. The 'script' element defines the ECMAScript which makes the animation happen. The StartAnimation() function is only called once to give a value to global variable text_element and to make the initial call to ShowAndGrowElement(). ShowAndGrowElement() is called every 50 milliseconds and resets the transform and style attributes on the text element to new values each time it is called. At the end of ShowAndGrowElement, the function tells the ECMAScript engine to call itself again after 50 more milliseconds. The 'g' element shifts the coordinate system so that the origin is shifted toward the lower-left of the viewing area. It also defines the fill color and font-size to use when drawing the text string. The 'text' element contains the text string and is the element whose attributes get changed during the animation. If scripts are modifying the same attributes or properties that are being animated by SVG's animation elements, the scripts modify the base value for the animation. If a base value is modified while an animation element is animating the corresponding attribute or property, the animations are required to adjust dynamically to the new base value. If a script is modifying a property on the override style sheet at the same time that an animation element is animating that property, the result is implementation-dependent; thus, it is recommended that this be avoided. The ElementTimeControl interface, part of the org.w3c.dom.smil module and defined in SMIL Animation: Supported interfaces, defines common methods for elements which define animation behaviors compatible with SMIL Animation. Calling beginElement() causes the animation to begin in the same way that an animation with event-based begin timing begins. The effective begin time is the current presentation time at the time of the DOM method call. Note that beginElement() is subject to the restart attribute in the same manner that event-based begin timing is. If an animation is specified to disallow restarting at a given point, beginElement() methods calls must fail. Refer also to the section Restarting animation. Calling beginElementAt(seconds) has the same behavior as beginElement(), except that the effective begin time is offset from the current presentation time by an amount specified as a parameter. Passing a negative value for the offset causes the element to begin as for beginElement(), but has the effect that the element begins at the specified offset into its active duration. The beginElementAt() method must also respect the restart attribute. The restart semantics for a beginElementAt() method call are evaluated at the time of the method call, and not at the effective begin time specified by the offset parameter. Calling endElement() causes an animation to end the active duration, just as end does. Depending upon the value of the fill attribute, the animation effect may no longer be applied, or it may be frozen at the current effect. Refer also to the section Freezing animations. If an animation is not currently active (i.e. if it has not yet begun or if it is frozen), the endElement() method will fail. Calling endElementAt() causes an animation to end the active duration, just as endElement() does, but allows the caller to specify a positive offset, to cause the element to end at a point in the future. Other than delaying when the end actually happens, the semantics are identical to those for endElement(). If endElementAt() is called more than once while an element is active, the end time specified by the last method call will determine the end behavior. Causes this element to begin the local timeline (subject to restart constraints). The element is already active and cannot be restarted when it is active. The restart attribute is set to "whenNotActive". The element is active or has been active and cannot be restarted. The restart attribute is set to "never". SYNTAX_ERR: The element was not defined with the appropriate syntax to allow beginElement calls. Causes this element to begin the local timeline (subject to restart constraints), at the passed offset from the current time when the method is called. If the offset is >= 0, the semantics are equivalent to an event-base begin with the specified offset. If the offset is < 0, the semantics are equivalent to beginElement(), but the element active duration is evaluated as though the element had begun at the passed (negative) offset from the current time when the method is called. in float offset The offset in seconds at which to begin the element. SYNTAX_ERR: The element was not defined with the appropriate syntax to allow beginElementAt calls. Causes this element to end the local timeline. The element is not active. SYNTAX_ERR: The element was not defined with the appropriate syntax to allow endElement calls. Causes this element to end the local timeline at the specified offset from the current time when the method is called. in float offset The offset in seconds at which to end the element. Must be >= 0. SYNTAX_ERR: The element was not defined with the appropriate syntax to allow endElementAt calls. The TimeEvent interface, defined in SMIL Animation: Supported interfaces defined in SMIL Animation: Supported interfaces, provides specific contextual information associated with Time events. This event is raised when the element local timeline begins to play. It will be raised each time the element begins the active duration (i.e. when it restarts, but not when it repeats). It may be raised both in the course of normal (i.e. scheduled or interactive) timeline play, as well as in the case that the element was begun with the beginElement() or beginElementAt() methods. Note that if an element is restarted while it is currently playing, the element will raise an end event and another begin event, as the element restarts. This event is raised at the active end of the element. Note that this event is not raised at the simple end of each repeat. This event may be raised both in the course of normal (i.e. scheduled or interactive) timeline play, as well as in the case that the element was ended with the endElement() or endElementAt() methods. Note that if an element is restarted while it is currently playing, the element will raise an end event and another begin event, as the element restarts. This event is raised when an element local timeline repeats. It will be raised each time the element repeats, after the first iteration. The event provides a numerical indication of which repeat iteration is beginning. The value is a 0-based integer, but the repeat event is not raised for the first iteration and so the observed values of the detail attribute will be >= 1. The view attribute identifies the AbstractView [DOM2-VIEWS] from which the event was generated. The initTimeEvent method is used to initialize the value of a TimeEvent created through the DocumentEvent interface. This method may only be called before the TimeEvent has been dispatched via the dispatchEvent method, though it may be called multiple times during that phase if necessary. If called multiple times, the final invocation takes precedence. in DOMString typeArg Specifies the event type. in views::AbstractView viewArg Specifies the Event's AbstractView. in long detailArg Specifies the Event's detail. The following interfaces are defined below: SVGAnimationElement, SVGAnimateElement, SVGSetElement, SVGAnimateMotionElement, SVGMPathElement, SVGAnimateColorElement, SVGAnimateTransformElement. The SVGAnimationElement interface is the base interface for all of the animation element interfaces: SVGAnimateElement, SVGSetElement, SVGAnimateColorElement, SVGAnimateMotionElement and SVGAnimateTransformElement. Unlike other SVG DOM interfaces, the SVG DOM does not specify convenience DOM properties corresponding to the various language attributes on SVG's animation elements. Specification of these convenience properties in a way that will be compatible with future versions of SMIL Animation is expected in a future version of SVG. The current method for accessing and modifying the attributes on the animation elements is to use the standard getAttribute, setAttribute, getAttributeNS and setAttributeNS defined in DOM2. The element which is being animated. Returns the start time in seconds for this animation. float The start time in seconds for this animation relative to the start time of the time container. Returns the current time in seconds relative to time zero for the given time container. float The current time in seconds relative to time zero for the given time container. Returns the number of seconds for the simple duration for this animation. If the simple duration is undefined (e.g., the end time is indefinite), then an exception is raised. float The number of seconds for the simple duration for this animation. NOT_SUPPORTED_ERR: The simple duration is not determined on the given element. The SVGAnimateElement interface corresponds to the 'animate' element. Object-oriented access to the attributes of the 'animate' element via the SVG DOM is not available. The SVGSetElement interface corresponds to the 'set' element. Object-oriented access to the attributes of the 'set' element via the SVG DOM is not available. The SVGAnimateMotionElement interface corresponds to the 'animateMotion' element. Object-oriented access to the attributes of the 'animateMotion' element via the SVG DOM is not available. The SVGMPathElement interface corresponds to the 'mpath' element. The SVGAnimateColorElement interface corresponds to the 'animateColor' element. Object-oriented access to the attributes of the 'animateColor' element via the SVG DOM is not available. The SVGAnimateTransformElement interface corresponds to the 'animateTransform' element. Object-oriented access to the attributes of the 'animateTransform' element via the SVG DOM is not available.